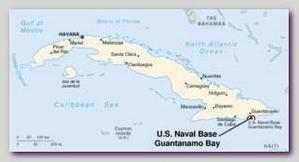 GUantanamo Bay is on the eastern end of Cuba Island. USA leased in 1903 116 km2 for 99 years for USA Naval base as a part of Cuban-American treaty, that came after the Spanish- American war of 1898. There is an international judicial debate if the USA presence on Cuba’s’ territory is still legal or an USA illegal occupation. After the war in Afghanistan in 12/2001, operation ” Absolute Justice “, the naval base serves as a detention camp for “Enemy Combatants” since the place is not, legally, under USA sovereignty and human rights, anchored in USA constitution, do not apply in that place. “Enemy Combatants” is a term not to define the detainees as “prisoner of war” which give the prisoners legal rights, the protection of international war laws and the sponsorship of the international ”Red Cross”. In GUantanamo some of the most dangerous Al Qaeda s’ terrorists are imprisoned. There are also some dozens that were brought there by mistake or accidentally. According to figures, released by the Pentagon on 04/19/2006, 490 suspected as terrorists are still detained in GUantanamo and 204 were released without any charges. Only few from the released people returned to terror. On 05/19/2006 the USA released 15 Saudis without any charges and sent them back to Saudi Arabia. Other 57 prisoners were handed over to their homeland countries for legal procedures there.On 09/08/2007, after US released back home 16 Saudi citizens from GUantanamo, the number of detainees remaining in the camp reduced to 340. Washington is reducing the number of prisoners at the centre with a view to eventually close t down. Two staff members from Muslim faith, James Yee and Ahmed Mehalba were arrested in 2003 for allegedly spying for Al Qaeda in GUantanamo but all three cases ended up with all the serious charges dropped. Ahmad al-Halabi and Ahmed Mehalba were, eventually, convicted on minor charges and sentenced for less then a year in jail. * On 01/22/2009, two days after his inauguration, the new President of USA, Barack Obama, ordered the closure of the GUantanamo Bay prison camp as well as all overseas CIA detention centers for terror suspects (see also – Gitmo-the end ). * More than 700 classified military files, part of a massive cache of secret documents leaked to the Whistle-blowing WIkILEAKS WEBSITE, were made available to select U.S and European media outlets and made public on Sunday 04/24/2011. According to the trove of leaked military documents the USA released dozens of so-called “high-risk” detainees from the GUantanamo Bay prison facility and held more than 150 innocent men for years. They included drivers, farmers and chefs, who were rounded up as part of frantic intelligence gathering, and then detained for years. * In a pretrial hearing for suspected Al Qaeda bomber Abd al-Rahim al-Nashiri at the GUantanamo war crimes court on Tuesday 01/17/2012, ,the GUantanamo commander, Rear Admiral David Woods, testified that a copy of an Al Qaeda-linked INSPIRE MAGAZINE was delivered to the GUantanamo detention camp for suspected terrorists, a military prosecutor revealed on Wednesday during a courtroom discussion of mail security. The GUantanamo commander issued orders, on 12/2011, tightening the screening of mail sent by lawyers to their clients at the camp that still holds 171 captives.